At Capital Edge Paintball Park, we know that our reputation is our most valuable form of advertisement. The only way to make sure that advertisement is the best it can be is to give 110% to our customers experience everyday. We strive to make sure that every visit to CEPP is your best visit yet. We want to ensure that every player from the first-timer to the seasoned tournament player feels welcome and comfortable in a friendly and helpful environment. "Thank you for the fabulous, fun-filled day of paintball! This was my first experience with paintball and I loved it! The whole family was there to enjoy the thrill. The safety rules were easy to follow and explicitly enforced. I appreciated that there was no profanity and everyone (especially the staff) was extremely polite and friendIy. I also appreciated the help that the professionals gave me. I am really looking forward to playing again and next time I will bring some of my Mom-friends and their families as well! This is a fabulous place for young people to spend time, learn to be a good-sport, and meet great people. 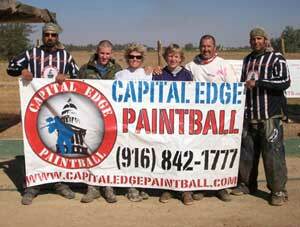 Capital Edge Paintball provides superior safety, and customer enjoyment!" "I played at Capital Edge for the first time this weekend. I have played many of the fields in northern California. Capital Edge has the best airball fields in the Sacramento area. The field was immaculate from the picnic tables to the fields. Games were run nonstop with outstanding refs. I play with both of my sons and we love paintball. We will be playing at your field allot. Simply one of the best ran fields I have ever played. Organized play and awesome fields." When I first went with my brothers I surely thought that I was out of my league. However, I soon discovered the level of excitement and rush you get when you?re out on the field. Being out there was really a great experience. I absolutely loved it! 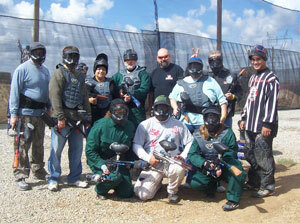 Capital Edge Paintball provides an affordable, safe, thrilling, family-friendly environment. I was impressed by the attentiveness of the staff and camaraderie of all the participants. I strongly encourage you (especially the ladies) to take part in this phenomenal paintball experience. I can?t think of a better way to spend a Saturday in Sacramento. Honestly I had a blast and look forward to going back. Thanks Capital Edge Paintball!" 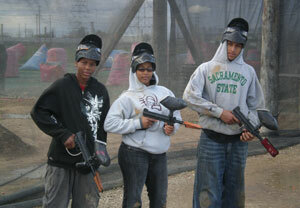 I wanted to let you know how much fun our family had playing paintball at your facility. We came to celebrate my husband's 40th birthday. I LOVE that you are so geared to families and that our family was able to play together! We had every decade represented in our family from teenager (16) to the 60's. I think the 60-year-old had the most fun of all of us. Please know that we plan on coming out again in the future. We truly had a GREAT time!" "When my eleven-year-old son, Carl, asked me four months ago if he could play paintball, my first reaction was probably typical of most parents who want to be act responsibly, that was to say, No, youll shoot your eye out. Eventually, after doing some internet research on the sport, I relented and agreed to take Carl and his friend Jake to one of the local paintball parks. Luckily for us, the first place we chose to try this sport was Capital Edge Paintball Park (CEPP). From that first day we arrived at CEPP to now, the superior customer service we received and more importantly, their attention to safety has never failed to amaze me. Dave Bains, the resident Paintball Professional, his brother, Deep, their father, their sister and all of the other CEPP staff have created an environment where players of all ages, skill-levels, gender, shape and size can participate in a safe, friendly, and family-oriented environment. Ive also discovered that this is not only an extremely fun sport, but one that has definite health and fitness benefits, particularly for kids. Basically, if a player commits themselves to getting better at paintball, they will also have to commit themselves to getting more physically fit. I've noticed a definite improvement in my son's level of fitness since starting paintball. Another benefit Ive observed for children playing at CEPP is the sportsmanship, focus, teamwork and camaraderie these kids develop. While players don't have to come to CEPP with their own team, the games will usually entail being placed on one - thus the need to work as team in order to be successful. Honesty and integrity are also character traits that young people will develop as paintball participants. Like golf, where players are expected to call penalties on themselves, paintball competitors are expected to acknowledge when theyve been hit and take themselves out of the game. Needless to say, weve become weekend regulars at CEPP. 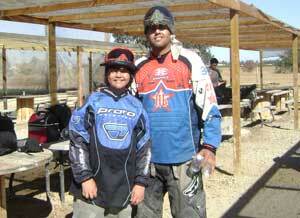 In fact, my son recently participated in CEPPs September 27-28, paintball clinic. Led by Dave Bains and assisted by three of the best professional paintball players in the world, Carl and a number of other clinics participants were treated to hours of outstanding paintball instruction and training. I was particularly appreciative of the approach Dave and the other professionals took with my son as he was by far the youngest of the attendees. At the end of the clinic, my son had made some great new friends, received some awesome training, and had a fantastic time - another typical day at CEPP." "Just wanted to express what a great time our group had last weekend!!! Here is a picture of the Westcoast Wingsuit Challange - The day we were winded out." These guys jump out of planes for a living.